Learn the Trans-tibial meniscal root repair using Smith and Nephew Firstpass mini surgical technique with step by step instructions on OrthOracle. Our e-learning platform contains high resolution images and a certified CME of the Trans-tibial meniscal root repair using Smith and Nephew Firstpass mini surgical procedure. This is a presentation of the trans-tibial repair of an acute isolated lateral posterior root tear. Improved awareness and recognition of meniscal root tears has made this an area of significant interest amongst sports knee surgeons. This has driven implant companies to develop devices to aid the surgical technique as demonstrated here using the Smith and Nephew Firstpass Mini device and sided tibial aimers. The recent modification of the Firstpass is lower profile and has a simpler deployment mechanism to pass a suture or tape through the root of the meniscus. Tears of the posterior root of the medial meniscus are particularly difficult to access. Root tears are defined as tears or bony avulsions within 10mm of the anatomical tibial attachment of the meniscus. This is typically posterior but can occur anteriorly (often iatrogenic with intra-medullary nailing or ACL reconstruction). Lateral posterior root tears are often traumatic, whereas medial posterior root tears are degenerative in origin. The effect of a root tear is akin to a total loss of meniscal function. Therefore the prognosis of the knee is poor as a consequence. Their recognition and management is therefore key. Furthermore an unrecognised trauma lateral posterior root tear at the time of anterior cruciate ligament (ACL) reconstruction puts the graft at significantly increased risk of failure. 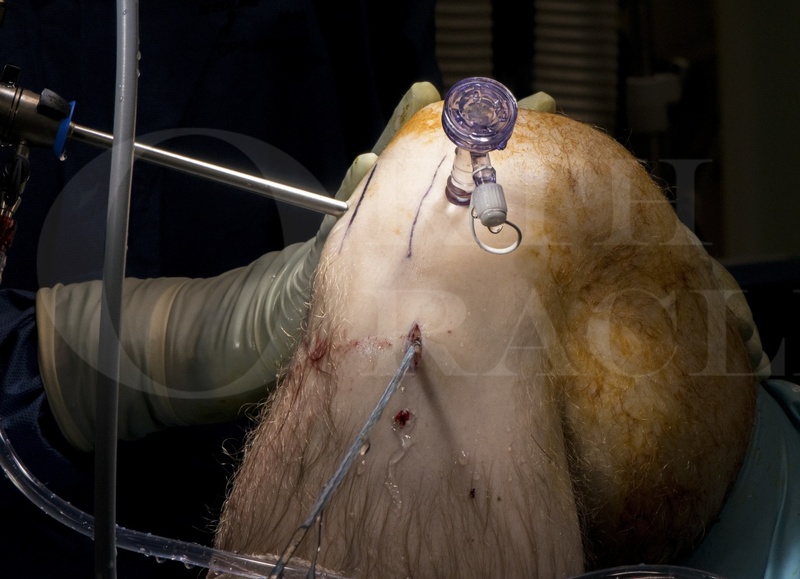 Increased knowledge and interest of root tears has drawn more attention from surgeons and radiologists alike, aiding diagnosis and driving the development of surgical techniques as described here. Transtibial techniques are considered the gold standard for surgical fixation of root tears. This case is a little unusual as it is an isolated traumatic lateral root tear. The majority of lateral root tears occur in association with a ligament injury, typically the anterior cruciate ligament (ACL). It is worth noting that 6-12% of ACL tears are associated with a lateral root tear. Much of the success of a root tear repair depends on the reduction of the tear to its anatomical position during repair.